Over the past few days, three herons have taken up residence at Jamaica Pond, along with the ducks and the geese. They'll stand for awhile along the shores, or perch on the branches of the tree on the island, and then something will catch their eye and they'll take off and fly over to another part of the pond. Wondering, if they are the same 3, having fun in malden, behind Comcast last Saturday? 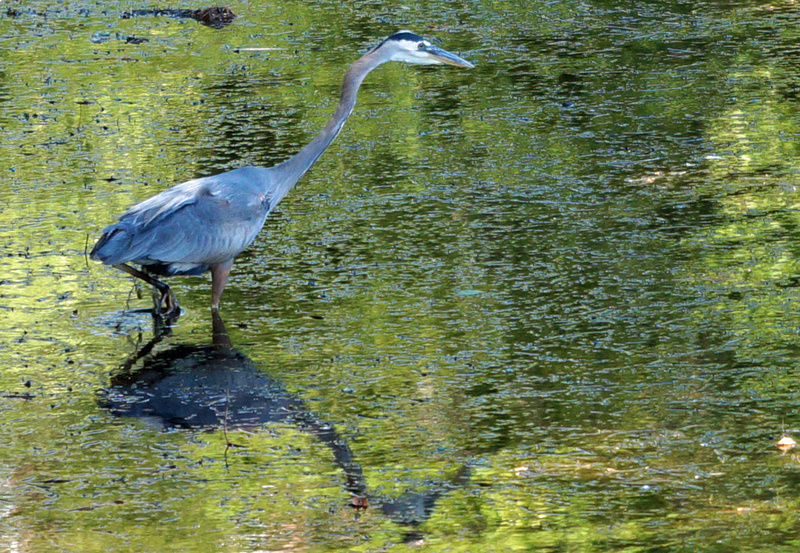 Jamaica Pond must be pretty special to be attracting blue herons. I don't live nearby but I'm beginning to understand why the locals love it so much. In addition to the fish that the governor and local school kids toss in every spring, I noticed a ton of baby fish along the beach the other day - so they're obviously reproducing (haven't seen Moby Carp this year, though). And, yeah, it's a great place to go for a walk (or run). I've seen them elsewhere on the Emerald Necklace - even on the stretch of the Muddy River at the end of Queensberry Street, between Park Drive and the Fenway (on Google maps they call it Higginson Circle). Same behavior, standing very still, easy to miss, then sloooowly moving forward, cocking the head and...STRIKE! The herring run up at least that far, so that may have been what this one was chowing down on. Disney did his work well. Gustav Klimt has gotten more interesting since he expanded his range of subjects. That may be his most inscrutable model yet. We actually saw four together on Wednesday. One ate a pretty large fish (~6") whole, and tangled with another. We couldn't tell which were juveniles or adults. It was cool to see them. I see the blue herons often (almost year round) at Leverett Pond and the quiet section up near Netherlands Rd - usually only one at a time. They stride gracefully in the water and are beautiful in flight. Please keep your pets on leashes so we don't have a repeat of when a dog killed a heron in the Arbs a few years back. Yes, yes - I'm sure *your* dog is super awesome and would never do anything wrong and needs to be walked off his leash, etc... but how about just following the law? At the Watertown dam on the Charles, there's regularly blue herons and night herons fishing. They make a killing when the herring are around. The Cornell Ornithology Lab in Ithaca's Sapsucker Pond had the remarkable good fortune to have a heron couple build a nest in a dead tress fork directly in front of the picture windows of the lab. The male was missing a toe, and so they could ID him from year to year. When they had reared chicks and all had fledged, the Cornell wizards climbed up the dead tree, took measurements of the nest, the materials used, shell remnants, etc., and then mounted webcams directly over and behind the nest for the next year. "Dad" and his mate continued to build the nest (called twigging), and "Mom" laid five eggs. A large brood is considered to be four. One of the eggs cracked, but luckily all five hatched, with the cracked egg chick hatching last - he was named "Fiver". He was a runt and remained smaller than the other chicks. As they grew - FAST - their stabby beaks became weapons to use against each other and the poor parents, shuttling in mouthfuls of goldfish (Cornell students contribute to healthy stocks of these). When the nestlings got so large and flight feathers came in, they would stand on the rim of the nest bowl and jump flap - testing wings, getting some air, and learning to balance. Fiver was so much smaller that there were fears he'd be killed or would starve. But he was canny and would duck down and stick his beak out from under the other chicks and literally spear the fish out of the parents' beaks. All five successfully fledged between 10-noon on successive days. When Fiver fledged, it looked like a pterodactyl with no steering. He flapped, glided and landed on a tree limb across the pond. You can view all of the video footage on YouTube. Look for the Cornell Lab channel. All this to say that the "new" herons you are seeing are likely recent fledglings that are still honing their fishing technique (Youngsters tend to walk and stalk the fish, while the pros find a good fishing spot and stay stock still allowing the fish to come to them). Adults often have a nuptial plume (a single long white feather that drapes down and behind their head and neck). Often that gets pulled out during mating, though, so no guarantees. Because herons are so dangerous to band/tag, they aren't. A researcher was killed by a blue heron when attempting that and the heron stabbed him in the neck and got the carotid artery. This is also why dogs should never be allowed near herons. No one is yet sure if herons mate for life. "Dad" came back to the same nest year after year, but the female(s) who showed up at the nest from year to year wasn't/weren't able to be IDed. Several years later, the nest blew out during a storm. I don't know if Cornell followed after that, as the cameras were removed. Laura Erickson is an ornithologist who works from home in Minn, but kept us apprised of all things heron for the online Cornell Lab chats. She's published widely and she writes an exquisite blog that ties her life stories to our beautiful birds. Sorry for the length - hope you enjoy!